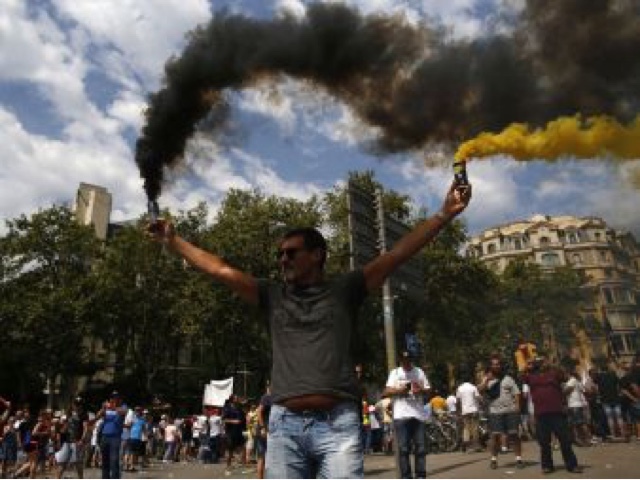 BARCELONA, Spain — Taxi drivers from all corners of Spain drove to Barcelona to join a 2-day strike that started Wednesday in protest of the growing number of cars operating under ride-hailing apps. Uber and Cabify briefly halted service, saying some of their drivers were attacked. The taxi drivers, who joined a raucous protest in front of the Arch of Triumph, oppose the recent suspension of additional authorization required for ride-hailing companies to operate in Barcelona. They want a previously agreed ratio of 30 taxi licenses for every authorized ride-hailing car to be honoured. The current ratio in Catalonia, the Spanish region of which Barcelona is the capital, stands at about 6.7 to 1. Thousands of demonstrators lit firecrackers and honked car horns as they marched to a government building to demand more regulation on the ride-booking apps they claim are taking away their jobs. Later Wednesday, Uber and Cabify announced they were temporarily suspending service in Barcelona after some of their drivers were assaulted on the sidelines of the pro-taxi demonstration. Eduardo Martin, spokesman for Unauto, the Spanish national association for drivers of ride-hailing apps, including Uber and Cabify, said there had been dozens of assaults of Uber and Cabify drivers and passengers in Barcelona, mainly in front of hotels. Two drivers were hospitalized, he said. One was left unconscious, and the other was taken to the hospital with first-degree burns to his face after an acid attack. Cars were left with broken windows and wing mirrors.